Everyone knows that a dog is man’s best friend, including your kids. And, now that they’ve successfully been begging for a dog for the longest time, the best of possible tactics is to aim for a trial run. After all, a dog can be a rough transition for a house that isn’t totally prepared for a canine buddy. Between rented apartments, fur-devouring carpets, or those nasty allergies, sometimes it is tough to bring a dog home. And, even if you can, it doesn’t take too long for those kiddos to realize that one best friend isn’t nearly as good as having all the best friends. How can you play the right role of a doggy without the right accessories? This dalmatian ears and tail create a convincing transformation. These polyester fleece ears are sewn to each side of a polyurethane headband, also covered in white and black spotted material. The tail is stuffed and has a Velcro attachment to fasten to a belt loop or safety pin. Perhaps the ears and tail is enough, but you can push the puppy polymorphing even more by suiting up in a Dalmatian jumpsuit. 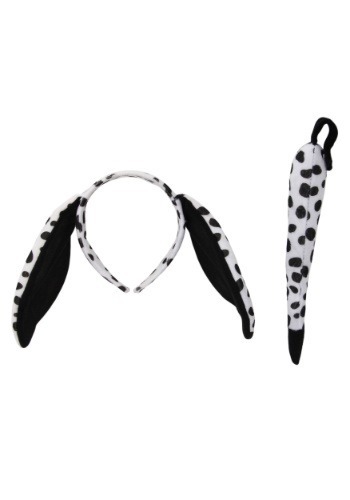 Whether you decide to pair the kit with a costume or you want to wear comfortable black and white clothing with the ears and tail, you'll make a convincing canine. Our only advice is to watch out for any passing Cruella DeVil type dog-lovers!